It's Dr. Mario for an intense new challenge! Mario throws multi-colored vitamin capsules into a bottle that contains an ugly variety of nasty viruses. 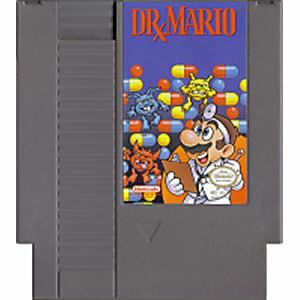 In Dr. Mario, players rotate "pill" pieces as they fall, attempting to clear their screen without spilling over the top. If you can get four or more of the same color in a row, they disappear. Destroy all of the viruses in the bottle and you progress to the next round where things get even more difficult! Needless to say, the gameplay can get rather frantic in a hurry, especially in the series' staple multiplayer modes. Great Price! One of the Top all time 2 player competitor games. Would you want mario throwing pills at you? Sure, why not! Great classic game! The Dr. Mario game that I ordered came in good condition. My grandson and I have played it and it works good. Awesome game, works great and is very addictive. I received my package on the console and the games I ordered. Everything worked like my old game! Satisfied customer. Would recommend using Lukie games and website to all my friends. 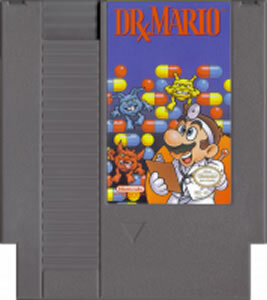 Ya, sorry Tetris fans, but just because Tetris came with every Gameboy doesn't mean they wouldn't have made Dr.Mario the pack in game if it was made sooner! NES version is the BEST! Thanks Lukie! Game works and plays great. Thanks Lukie! Game worked great and looked like brand new. Thanks Lukie! My wife and I had a blast playing this game. She could not put it down. If you like Tetris, you should like this game. The game came faster than I expected & was in excellent shape. My son was very happy. Plus, Dr. Mario is hours of fun. The game works great! Takes me back to my childhood days. The order arrived quickly. Ordering from Lukie Games has never disappointed. Thank you for your promptness and excellent customer service!